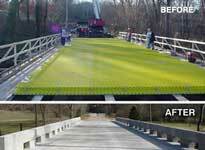 AASHTO HS-25 FRP Bridge Deck Systems. 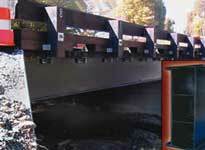 8" x 6" EXTREN DWB® double-web beams replaced 10" wide flange steel beams in the 18-foot span, two-lane bridge. The bridge was upgraded from a 10-ton to 20-ton capacity after the rusted, severely deteriorated steel beams were replaced. Total construction time for steel beam removal and replacement with the composite beams and a timber deck was less than five days. The bridge utilized FRP hybrid 8" x 6" double-web beam that has carbon fiber in the flanges to increase the beam's stiffness to more than 6 million psi. The unique double-web design featuring internal flange stiffeners also provided a beam with less than 1/2% rotation under three-point loading in laboratory tests. The Virginia Department of Transportation (VDOT) installed eight 36" x 18" EXTREN DWB® beams as a replacement for deteriorated steel beams in a two-lane vehicular bridge in Sugar Grove, Virginia. 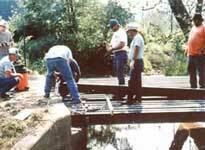 This bridge demonstration project was sponsored by the Innovative Bridge Research and Construction Program of the Federal Highway Administration. 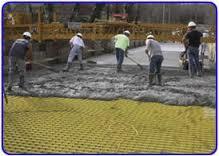 GRIDFORM™ is a pre-fabricated fiber reinforced polymer (FRP) double-layer grating, concrete-reinforcing system with integral stay-in-place (SIP) form for vehicular bridge decks. 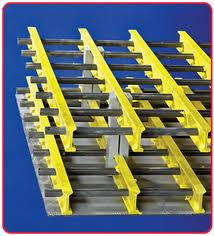 The system consists of FRP plates bonded to the bottom grating of FRP double-layer grating panels, creating a bidirectional, lightweight panel for the grid construction of corrosion-free concrete bridge decks. The lightweight GRIDFORM™ panel, which weighs only 4.7 pounds per square foot, is shop-fabricated in very large units that are limited only by shipping constraints to approximately 50 ft. by 8 ft. When the GRIDFORM™ arrives on site, it is lifted with a single pick of a crane and placed directly in the bridge girders. The GRIDFORM™ panel is pre-engineered and detailed to enable rapid attachment to the bridge girders and subsequent concrete placement and forming. The anticipated lifespan of a GRIDFORM™ bridge deck is several times that of steel reinforced concrete bridge decks since FRP provides a corrosion-free reinforcement system for the concrete.